SILVER SPRING, MD – The Montgomery County Planning Department, part of The Maryland-National Capital Park and Planning Commission, is highlighting its focus on historic preservation during Preservation Month in May. Information about technical support for property owners, tax credits and programs is available on the webpage of the Department’s Historic Preservation Office. Sign up for the Preservationist e-letter to receive regular updates about new projects, digital maps, videos and more. More than 750 archaeological sites have been discovered in Montgomery County, ranging from Native American rock shelters and villages, to areas that housed enslaved and free African American communities. The Montgomery County Department of Parks will be hosting events this month at some of these historic properties. Visit the 19th century slave quarters dig exhibit. 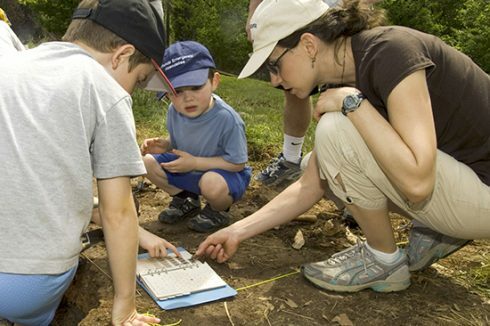 Participate in a simulated archaeology dig for children. Enjoy storytelling, old-time games and crafts. Discover the secrets of an historic rural farm with the help of professional archaeologists. Tour the historic Zeigler Log House and investigate hidden clues about its past. If your family can’t make it to one of these events or your little one is craving more history, then sign up for one of Montgomery Parks’ Archaeology Summer Camps! June 24 – A bicycle tour of historic sites in Montgomery County will be led by Planning Department staff to coincide with the Heritage Montgomery’s Heritage Days weekend celebration (happening Saturday June 23 and Sunday June 24 from noon to 4 p.m.). More details will be coming soon, including sign-ups and a tour map. Check montgomeryplanning.org for more information. The Planning Department’s historic preservation staff is reviewing applications from county property owners seeking financial rewards for faithfully restoring the exteriors of their historic structures. This tax credit may be granted against county real property taxes, based on the amount of money a homeowner spends on restoring or preserving a historic property. The property must be a designated historic site or be within a historic district designated in the Montgomery County Master Plan for Historic Preservation. Tax credits are approved for exterior work only and no credit is granted for new construction. The Planning Department will be holding a series of outreach meetings and open houses for county property owners interested in applying for the tax credits. Stay tuned to the Preservationist e-letter and our website for more details.